Annual Conference & Leadership Breakfast. 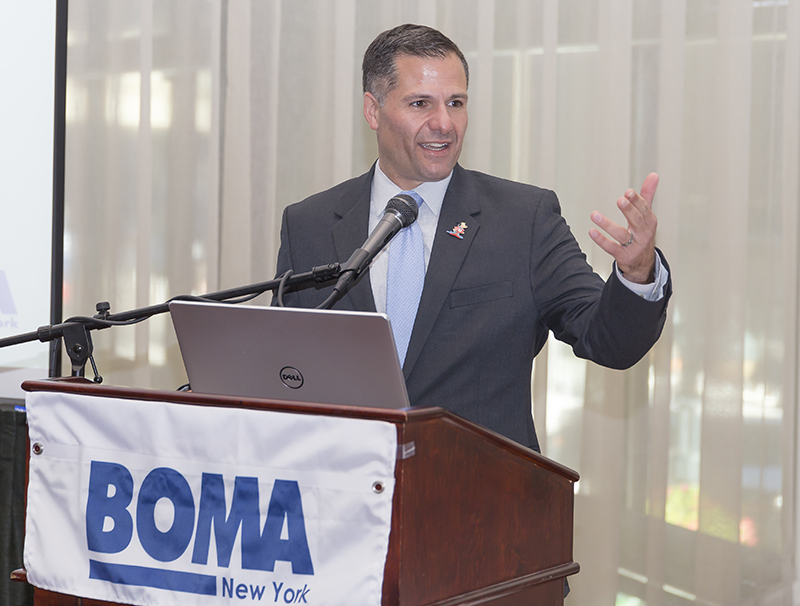 NEW YORK, NY BOMA NY’s 2018 Annual Conference & Leadership Breakfast, held on October 17th at Club 101, featured speakers Marc Molinaro, the Republican candidate for New York governor, and Kathryn Garcia, department of sanitation commissioner for NYC. Molinaro, the Dutchess County executive and contender to unseat Democratic incumbent Andrew Cuomo in the governor’s race, spoke passionately of the need to “humble” state government by fighting corruption in Albany and restricting its micromanagement of local administrations. He also argued that the state’s high taxes have contributed to population flight in already economically-depressed portions of Upstate New York. Molinaro first entered public office at the age of 18, when he was elected to the board of trustees in his hometown, the Village of Tivoli. In 1995, at only 19-years-old, he became the town’s mayor, making him the youngest mayor in America. He remained mayor until 2006, and credits his long, formative tenure overseeing every aspect of a small town’s operation, including keeping the streets and sewers clean, with teaching him “how government is supposed to function.” Molinaro went on to serve six years in the Dutchess County Legislature, followed by five years in the New York State Assembly, before taking the reigns as Dutchess County executive in 2012. 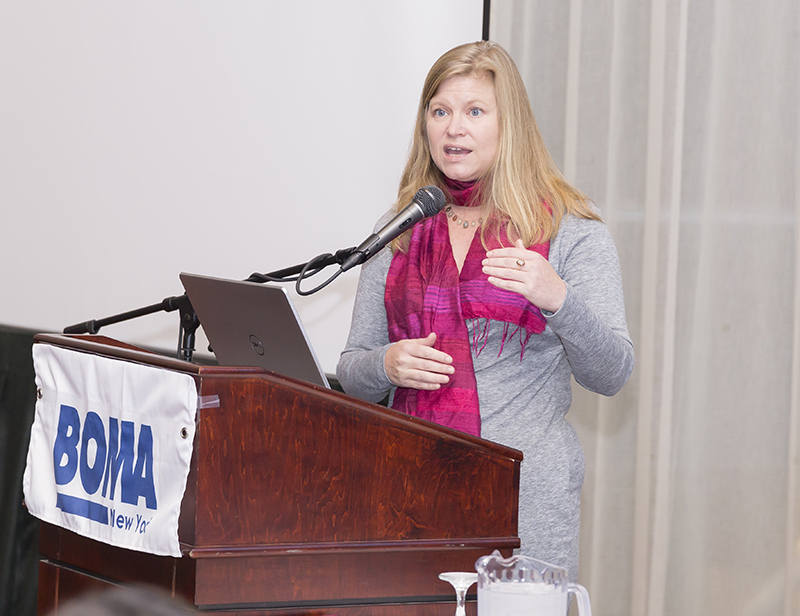 Following candidate Molinaro at the podium, NYC department of sanitation commissioner Garcia presented an overview of her department’s proposed Commercial Waste Zoning plan, which aims to limit the number of privately owned and operated garbage trucks on the city’s streets by 2023. Under the plan, the five boroughs would be divided into 20 distinct zones of roughly 6,000 commercial customers apiece, with no more than three to five carting companies permitted to operate within a given zone. The ultimate goal is to reduce traffic congestion and air pollution caused by what the city has determined is an excessively inefficient market for the private carting of non-residential waste. Historically, there have been no regulations limiting which carting companies may haul waste away from any private business, regardless of that business’s location – as long as the carter holds a license from the NYC Business Integrity Commission verifying it does not have associations with organized crime. Criticizing the current status quo of sprawling routes as being like the “wild west” Garcia cited examples of trucks traveling as far as 128 miles within the city in one night in order to reach 129 customers. According to DSNY analysis, because inefficiencies like this are systemic, the average aggregate daily mileage of all commercial carters in the city is about 79,000 miles, but the commissioner says that this figure will fall dramatically, down to only 29,000 miles per day, once Commercial Waste Zoning is fully implemented. Well aware that many commercial building operators are uneasy about the city’s plan, and object, in general, to any attempt by government to manipulate the market of one of their key vendors, the commissioner emphasized that price would weigh heavily (40%) in the process of procuring vendors for every zone. She also attempted to soothe concerns by predicting that, to a large extent, the small handful of dominant carters that most building owners are choosing from now will likely be part of the select few permitted to operate within any given Commercial Waste Zone. Smaller carting companies with a competitive advantage in specific areas would also likely come out ahead in those areas, she predicted. that a new local law will be on the books by the end of 2019; this law would not only empower the city to create the zones but establish its authority to procure vendors for each zone, and to oversee compliance with the relevant terms of carters’ contracts. Actual implementation of the new zones is slated for 2021. DSNY estimates that it will take until 2023 for the transition to Commercial Waste Zones to be complete. The hauling of demolition and construction debris, as well as medical waste and commercial kitchen grease, are not affected by the plan. The plan would also have no direct effect on residential waste pick up, which is handled by the city’s own municipal carting fleet, under the direct management of DSNY. The new members on next year’s board will be Kevin Hoey of L&L Holding Company and Michelle Landon of Oxford Properties Group, who will join Sharon Hart (Cushman & Wakefield), Alex Trotta (CBRE), Nickolas Hayden (JLL), and Laura Belt Ponomarev (The 58-64 40th Street Corp.) as directors-at-large. All four of the board’s current officers will serve the second year of their two-year terms in 2019. Ron Zeccardi (The Moinian Group) and Hani Salama (Capital Properties), will remain President and Vice President, respectively, while Matthew Duthie (Newmark Knight Frank) and Cynthia Boyea (Paramount Group) will retain their respective roles as Treasurer and Secretary.